Originally designed as a thank you gift for brides to give, this personalized plate makes a wonderful presentation for any occasion. Have your personal message permanently inscribed in 24 karat gold on your choice of a 6 1/4 inch plate or a 7 1/2 inch plate. Each plate comes individually gift boxed. The EGG is a symbol of new beginnings. Gaily bedecked for springtime, our porcelain eggs come in twelve different hand painted designs embellished with 24 karat gold. 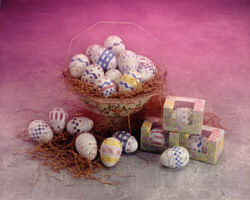 Each egg comes signed by the artist and individually gift boxed. To order your choice of designs, use the number below each egg. 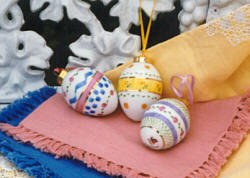 Add a splash of color to your table with these Easter egg napkin rings. Like our collectible eggs above, these porcelain napkin rings are hand painted, accented with 24 karat gold, and come in all twelve designs which are featured above. To order use #7063 and add the last two digits of the design of your choice. Example: for the napkin ring pictured to the far left you would order #7063-04; the far right would be #7063-02. 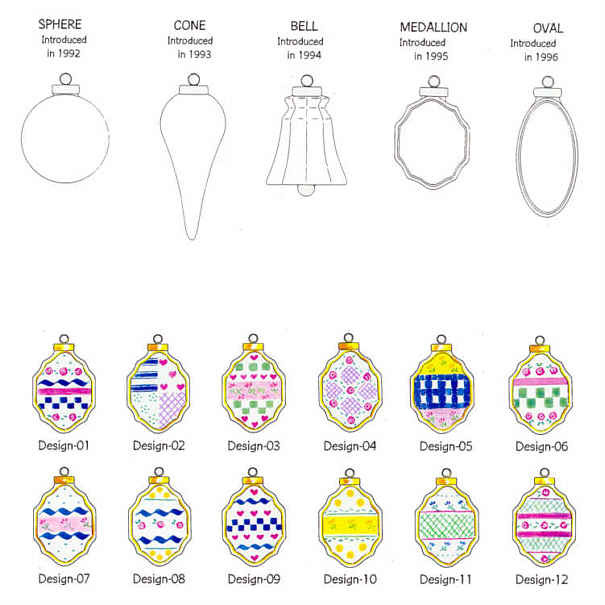 Throughout the years, a new Christmas ornament has been introduced to the Patchwork collection. Every ornament is hand painted in bright festive colors, accented in 24 karat gold, signed by the artist and gift boxed. Example: To order the bell with the yellow floral band around it, you would ask for #94-10. Sales price with gift box is just $27 each (purchase 12 or more at $25 each). Our 1997 Christmas ornament featured an egg, the symbol of new beginnings. 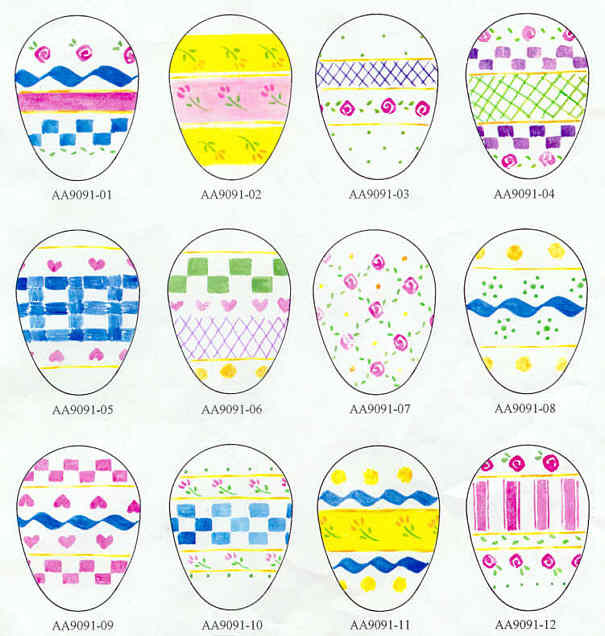 As with the previous years' shapes, these egg ornaments come in your choice of twelve different designs. To order, state the last two digits of the year (in this case, 97) and then add the two digit number of your choice of design. Use the drawing of the designs shown above. 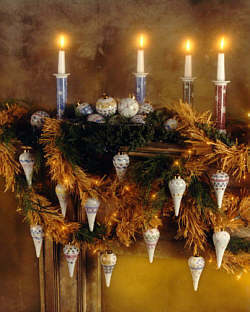 Every ornament is hand painted in bright festive colors, accented in 24 karat gold, signed by the artist and gift boxed. "Cookies for Santa" plate. 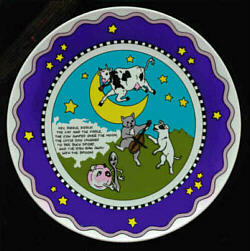 Delight your child or the young at heart with a plate made especially for that age old Christmas Eve tradition. 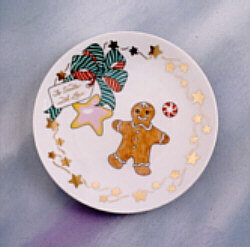 This keepsake is an 8.5" porcelain plate painted in Christmas colors. A gold garland of stars dances around the edge while our gingerbread man, a frosted cookie and old fashioned hard candy take center stage. A festive bow and tag which reads "To Santa with Love" completes the Christmas spirit. To add to this Christmas charm, you can have the tag personalized! Each plate comes individually gift boxed. 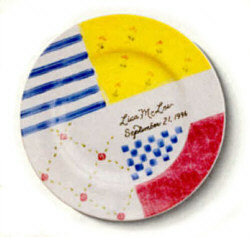 Plates sell for $40 each, or buy a set of six (two of each style) for $200. A savings of $40. How about a Nursery Plate to display on your child's wall or dresser! Bring back fond memories of everyone's favorite nonsense "Mother Goose" with Hey Diddle Diddle, the Cat and the Fiddle (the complete poem is written on the plate) . . . Vibrant colors and up-to-date design will look great in any room. This plate measures 7.5". 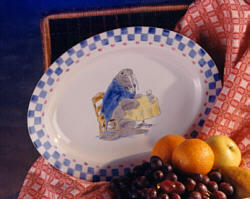 Add a little whimsy to your home with our 14.5 x 10.5" oval platter featuring "Humphrey" the rotund walrus, waiting to be served! 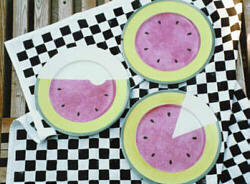 This platter is part of our Patchwork Collection shown on the Dinnerware and Tabletop Accessories page. You will find it will coordinate with most any kitchen, from country to contemporary, with or without Patchwork dinnerware! Our fine white porcelain platter is completely hand painted and signed by the artist, then kiln fired. Dishwasher and microwave safe . . . perfect for today's lifestyle! Order #AA8015 Humphrey . . . $239 each. "Nancy's art pieces are exquisite and the personal, friendly, and helpful service she provides is responsible for making my wedding thank-you gifts a huge success!" Julie of TX. "I started with one ornament, and now have an entire tree with NCM Studio ornaments. It's gorgeous!" Deborah of PA.
"My daughters look forward to finding their new Easter eggs each year! They are beautiful and will become a collection that they can pass on to their children." Carol of IA. "My Bridesmaids nearly cried. They thought I'd come up with the most creative and personal gifts. I was really touched by their sincerity. Please RUSH me a catalog . . ." Karri of MO.